If you are concerned about any E-Safety issues then please contact either your child’s teacher or Mr Unsworth (School E-Safety Officer). We have updated our E-Safety and Acceptable Use Policy– Please ensure this is signed and returned to us. A full version can be downloaded by following the link at the bottom of the page. 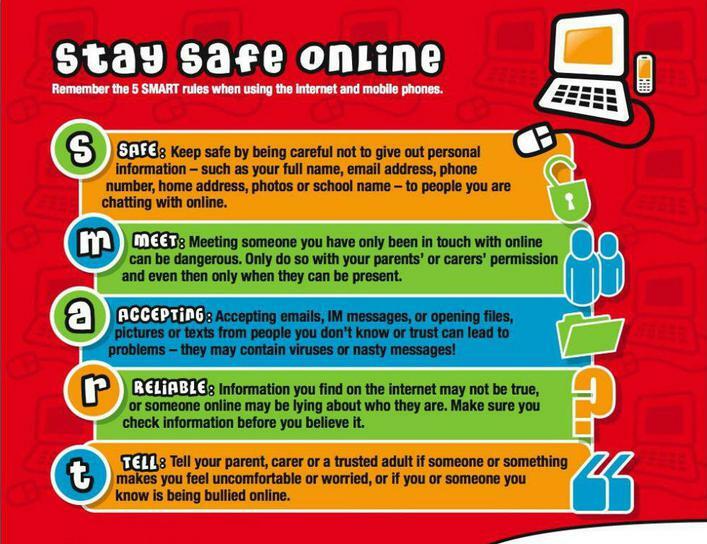 We will continue to promote the SMART E-Safety rules in school. We continue to teach E-Safety through all of our Computing education as well as a dedicated E-Safety module in term 3. 1. Keep the computer in a family area not in the child's bedroom. 2. Use 'child lock' or filter settings on your Web browser to help prevent unsuitable site access by your child. 3. Regularly supervise the sites your child is visiting. 4. Encourage your child to use their Favourites list to access the sites you have approved to prevent accidental entry to unsuitable sites. 5. Discourage your child from using social Networking sites e.g. MSN, Facebook, Bebo etc. to keep them safe from cyber bullying. 6. Teach your child to switch the monitor off or close the laptop lid, then fetch or tell you if something unsuitable appears on the screen. This is what we do in school. 7. Agree with older children what sites they are allowed to access. 8. Keep all personal details private and be aware of stranger danger. 9. Above all, encourage your child to talk to you about the web sites and electronic devices they are using at home and school. One of the fastest growing areas of internet use today is social networking. There are over 3,000 social networking sites on the internet. This is changing the way that we communicate. On most of these sites, it is incredibly easy to communicate with our friends, in many cases, sharing lots of personal information and photographs. · Facebook and Bebo set their age limit at 13. · MySpace set their limit at 14. There are some things to remember when you are surfing the internet. 1. Treat your password like your toothbrush - keep it to yourself! 2. Keep your home address, your phone number or email address off the internet, MSN and chat rooms. 3. Learn to report someone who is behaving badly. 4. Save the evidence - learn to save emails or on-line conversations. 5. Don't retaliate or reply. 6. Always respect others - think carefully about what you are typing. 7. Tell someone you trust if you see something that worries or upsets you. 8. Remember what you have learned in school - use that at home.